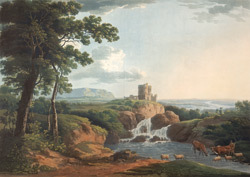 The romantic scenery of the Lake District attracted increased number of visitors in the late 18th century and 19th century. This was particularly true after Wordsworth published his 'Guide to the Lakes' in 1810. Wealthy travellers who had previously enjoyed grand tours of Europe (before the war with France intervened) now viewed a tour of the lakes as an attractive prospect.